All of the dogs and puppies on these pages will be altered, crate trained or housebroken as well as up to date on all shots and wormings. The older dogs have also started basic training. If you see a dog on this page that you are interested in click on the mail box. The adoption fee is $150 per dog for every dog unless other wise noted. 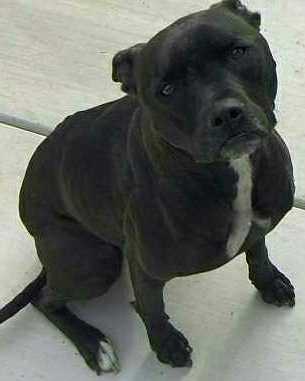 "Savannah" is a 3 1\2 year old spayed pit mix. She walks well on a leash and loves to go for walks. She knows basic commands. She current on all shots, and is house trained. She gets along well with other pets and good with children. Savannah loves being with people, and is mostly an indoor dog. Logan is about 2 years old. Sobbe will be a year on 1/30/02. Logan is the blue fawn. Both are great with kids and other dogs. Neither have ever went after the cats. Both are crate trained. Sobbe is working on being house broken but Logan really needs someone to spend the one on one with him. Both boys are ready to go now. This sweet little girl is only 10 weeks old but is already in need of her own home. She is working on getting house broken and crate trained.